Professor John H Charlesworth, chairman of the steering committee that organized the recent Third Princeton Symposium in Jerusalem has published a disclaimer against the sensational claims that have been made following the event. This appears in full on the Society of Biblical Literature’s website. Confusion surrounded the conclusion of the symposium as academics who had participatedsigned statements contradicting the initial news reports. A summary report on the Princeton Theological Seminary site also included statements rebutting the coverage by the news media. Unfortunately, the press subsequently reported an interview with Charlesworthhimself which appeared to add to the level of confusion. No full transcript of the interview was provided, so clearly there was no way to know the context of Charlesworth’s comments. A carefully planned and highly successful symposium in Jerusalem—on Jewish views of the afterlife and burial practices near Jerusalem before the destruction of the area by Roman armies in 70 CE—has been high-jacked by two disturbing and unexpected developments. Rather than leaving the symposium to academic discussion of the issues outlined, certain media individuals who have a vested interest in identifying the Talpiot tomb with the family of Jesus were able to gain the advantage. Hence confusion has reigned over the outcome of the symposium. An excellent example of the point I have sought to make in the last two posts arrived in my in-box yesterday. The latest Review of Biblical Literature contained two items about a recent title from T&T Clark. 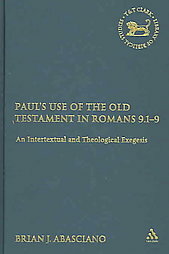 The book in question is Brian J. Abasciano’s Paul’s Use of the Old Testament in Romans 9.1–9: An Intertextual and Theological Exegesis. This book is a redo of Brian’s doctoral thesis at Aberdeen University; a study of the use of Exodus 32-34 and Genesis 18-21 in the first 9 verses of Romans 9. In writing this analysis, Abasciano builds on the previous work relating to intertextuality by Richard Hays. His thesis is that the apostle viewed Scripture as discrete wholes, with each appeal to a particular text entailing its immediate literary context. The assumption is that the scripturally adept readers (or hearers) of a Pauline letter would have recognized not only the source of such an appeal but its textual context as well, thus allowing the whole to inform their understanding of the apostolic point being scored by the specific textual reference. In that the book of Romans was written to both Jewish and gentile believers, Paul clearly required an intimate understanding of these key passages in making his argument. The fact that Abasciano can write more than 200 pages on Paul’s dependence on two sections of Scripture that span just 9 verses shows how important knowledge of the Scriptures was to the early followers of Jesus, whether Jew or gentile. Above all this is a book to be borrowed, not bought. At $120.00 or $140.00, depending on the reviewer, this is best acquired from the library shelf! To whom were the New Testament books written? To evaluate whether a New Testament book was written for a Jewish or gentile congregation based on its usage of the Hebrew Scriptures misses a major consideration. If we were to remove from the New Testament all elements of the Hebrew Scriptures, whether quotations, allusions, references and types we would be left with very little material. Marcion attempted this in the second century and ended up with a reduced New Testament which was comprised of part of Luke’s Gospel and Paul’s Epistles. The fact is that the New Testament was written to people who were clearly aware of and alert to what was written in the Hebrew Scriptures. What we often fail to appreciate is that where quotations were given from the Hebrew Scriptures, the readers or audiences of the writing were expected to put the quotation(s) into context. Quotations or allusions were actually a reference to a larger argument that the writer was presenting rather than simply a support or an authority for a claim as we so frequently use quotations today. The apostle Paul used quotations from Scripture liberally throughout his writings, without a question as to whether the gentile followers would understand. He speaks about the sacrificial system and expects even the gentiles to understand what happened in the temple in Jerusalem (Romans 12:1, 1 Corinthians 10:18). This indicates that the gentiles were expected to have a considerable degree of appreciation of the Scriptures. The same expectation continues in those epistles which scholars consider were subsequently written byPaul’s followers. The writer of the Second Epistle to Timothy is explicit in his concern about the importance of understanding existing Scripture (2 Timothy 3:14-16). This adds an interesting perspective to the point of James at the Jerusalem Conference recorded in Acts. Luke records James stating at the conclusion of the instructions to the gentiles that “from ancient generations Moses has had in every city those who proclaim him, for he is read every Sabbath in the synagogues” (Acts 15:21 ESV). Was this just a throwaway statement by James or was it intended as part of the instruction to the gentiles that they were responsible for coming to understand the content of the Scriptures? If the latter, then they were given a responsibility to acquire a context in which to understand the teachings of the apostles and the church. Judging from the way in which the books of the New Testament have been written, James's statement needs to be considered part of the instruction to the gentile followers. Considering this then, we have a situation where the New Testament was written for individuals—whether Jew or gentile—who had immersed themselves in the Scriptures and were able to contextualize the writings. This was an aspect that was quickly lost as the separation between church and synagogue developed over the succeeding centuries. Was the audience Jewish or gentile? An interesting debate is appearing amongst bloggers about the original audience for whom the First Epistle of Peter was written. Were they Jews or were they gentiles before coming part of the Church? The author of the epistle doesn’t address the identity of his audience directly, but rather leaves us with some way markers. The problem for commentators is that Peter in writing his epistle expected his audience to know the Hebrew Scriptures. Hence some say that the audience must be Jewish. Not so say others, pointing to 1 Peter 1:18 and 1 Peter 2:10. Understandably, these verses are hard to contextualize if the audience came from a Jewish background. But perhaps the problem and solution lies elsewhere. Commentators today insist on seeing two distinct groups in the early church—converted Jews and converted pagans—who followed different sets of requirements. The Jews would have had to maintain their commitment to the Torah, while gentiles only kept the seven Noachide commandments. Thus the church had two standards of behavior required of its members. But what if there was only one standard for the early church and the followers of Jesus rather than the double standard that we have adopted today to justify Christianity’s own position—a position aided and abetted by Judaism to maintain a degree of separation between the two groups? Consider that the early gentile followers of Jesus started as being God-fearers in the Synagogues. As such, they already were exposed to the teachings of the scriptures, having heard them expounded to some degree in the Synagogue on a weekly basis. As a God-fearer, did they eat bacon for breakfast before heading off to the Synagogue for Sabbath prayers? The term God-fearers indicates a high level of commitment to the way of life set out by the God of Israel. Such people wanted to follow that ideal. Following Jesus of Nazareth was not contradictory to that goal just as it was not contradictory for a devout Jew of the same day. It may have had political consequences within the Jewish community, but it was not contradictory behavior. Imagine other gentiles coming into this group as a result of the teaching of Peter or another apostle or evangelist. Already, gentile God-fearers were being law observant together with those who had been devout Jews. It would be natural for new gentiles to follow the example of those who went before. Like the God-fearers they would have immersed themselves in the study of the Scriptures. In writing to the church inCorinth, it is apparent that Paul had spent considerable time and effort in teaching the Scriptures to the new converts (1 Corinthians 10:1-11). Consider then that Peter wrote his letter to a group of people, whose nationality remains unknown, but whose commitment to the God of Israel was central to their behavior. They could have been Jew or gentile. Both groups would then have known the Scriptures and would have been motivated by them in terms of their behavior and standards. Hence the problem of the audience identity as seen by commentators may be one of our own making, borne out of the insistence that there were different life styles for both Jew and gentile within the church. Can archaeology help bring peace in that city? Speak of archaeology and most in the western world think of Israel, with Jerusalem at its center. That’s the result of cultural attachments through the religion(s) we have inherited. A fascinating study of archaeology in this area is presented by Raphael Greenberg in the latest Jewish Quarterly and is worth a read. Greenberg examines the history and motivation of the pursuit of archaeology and concludes by asking whether archaeology could contribute to peace in Jerusalem? To this end he makes some suggestions. Greenberg has been involved in archaeology in Jerusalem since the 1970's. He has worked for the Israel Antiquities Authority and is a Senior Lecturer at Tel Aviv University. My suggestion – the whole article is worth a read. Jerusalem received an inch of snow this week! Not much for those who live in the snow belts of the world. But a friend living there replied to an e-mail about the situation with the simple response " I'm freezing!" It appears that Jerusalem receives at least one snow storm each year. 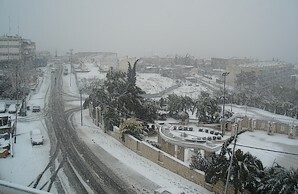 Photos are available on the web of Jerusalem blanketed in snow for most recent years. Aren Maeier posted this and other photos on his site and the BBC had several as well. Now Britain is digging out of a large snow storm itself. If we have snow today as an almost annual event in Jerusalem and surrounds, what does that say about snow and winter temperatures generally in antiquity? Perhaps Luke's comment about shepherds being in the fields with their flocks at the time of the birth of Jesus requires more careful consideration. Each month a blogger is chosen to put together a synopsis of all the blogs posted that month by those who are termed Bibliobloggers, i.e. people whose blogs are about some academic aspect of the Bible. The Biblical Studies Carnival is available on line at Kevin Edgecomb's blog biblicalia. This is the 26th carnival and shows the breadth of opinion and range of studies invovled in bloggerdom.